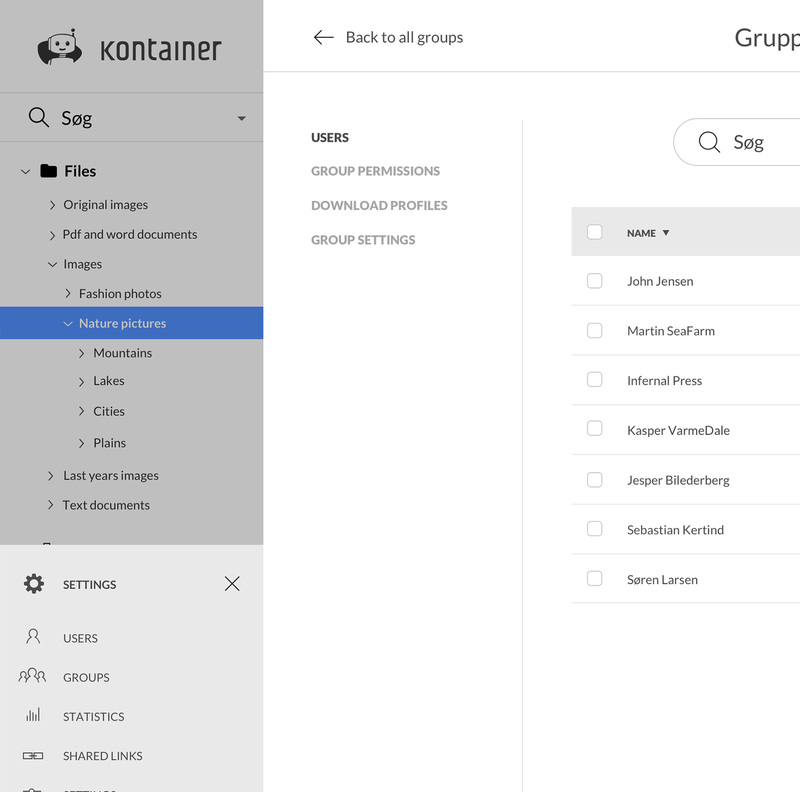 Using Kontainer you can create and categorize folders to suit your needs. Additionally, the administrator can provide different users or user groups differentiated accesses to different folders. This way, the individual user can only view the folders they have been granted access to. Kontainer is designed to fit into your daily life. Therefore, we would like to tailor the system's functionality and design to make it the best possible tool for you. 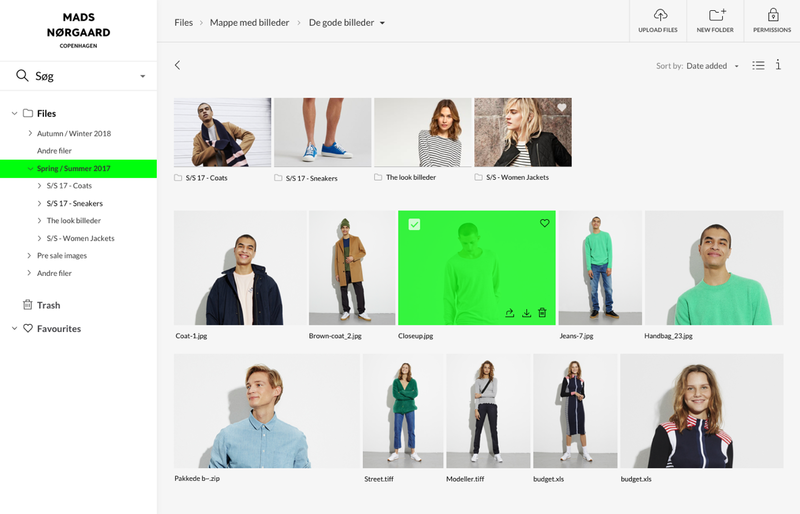 It may be important for you to be able to associate special data with individual files or generate JPG's for web in a predefined size, all directly from the Kontainer system. In addition to the usual file exchange, Kontainer also supports file exchange through email. That allows, you to select different files from the system and send them to one or more recipients. In addition, Kontainer facilitates users to mail an encrypted link to a folder. In that case, the recipient can click the link and be taken directly into the folder with the files without having to login. Upload is made easily and quick with the built-in "Multi-Select" feature. That way, you can easily upload many files at once. Once the files are uploaded, a thumbnail preview is autogenerated, so all files can be viewed, regardless of format. This also applies to, e.g. logos made in Illustrator in .eps or .ai files as in Kontainer can easily be viewed and shared without having to open them in Illustrator. In Kontainer, users and customers can use "Collections" and the favorite functionality to select and comment on files. This optimizes the selection process between multiple users, making it easy and more secure to exchange, comment and select files, whether internal or external. Through Kontainer's built-in conversion tool, audio and video files can be converted to various common, pre-defined formats such as Mp3, QuickTime, Flash Video and many more. If you want special formats for special channels, this can be customized to your Kontainer. Integrate DAM system Kontainer with company CMS, ERP, CRM, apps, etc. Kontainer structures and creates an overview of all your company photos, files, logos and videos. In order to be able to use it optimally, it often makes sense to integrate Kontainer with other of your core systems that use photos and files. That way, your files will be directly accessible to the right users, on the right channels around the world, and you will be guaranteed to work with the correct version of your image, logo or document. Easy and secure sharing of files, photos, videos, etc. Kontainer helps simplify and support many of your daily processes. Kontainer makes it easier to find images in specific sizes or formats, share large files, and manage user rights. Our great data security requirements and the possibility of 80 days re-establishment, ensure your data best as possible! With Kontainer, you can easily see which users have logged in and when. In addition, you can easily find out who has downloaded what and when they have done it. This ensures that you always have an overview of which files are used in what context. Kontainer is an all-in-one solution. Kontainer both allows you to reduce, crop and rotate images. Additionally, you can save images in new formats, e.g., optimized for web, PowerPoint or Print, as well as exporting in all the formats you want. With Kontainer, you can autogenize PDF listings of selected files from the system. You can generate and print contact sheets at any time with selected images and information. This makes it easy to produce and deliver presentation material for meetings. An important Kontainer feature is the advanced search feature. The function searches all metadata and can be set up to search for all parameters. Kontainer is operated on its own professional cloud installation located in 2 hosting centers in Copenhagen. Backups are made daily with 80 days of rehabilitation. At Kontainer, we have worked purposefully to be compliant with the EU Personal Data Regulation (GDPR). Kontainer is ISAE 3402 certified to handle the high level of data security requirements where controls and procedures are based on ISO27001 / 2 standards. Kontainer is a web based Digital Asset Management system and therefore requires no installation on users' computers. The system is accessed from any computer with network access. Log in with username and password and you will automatically access the system. Our support is always ready to help you and your colleagues with your Kontainer. We know that good and competent support is essential for Kontainer to improve your everyday life. If you need integration and customization of your Kontainer or have a question you need answered, we're ready to help you! 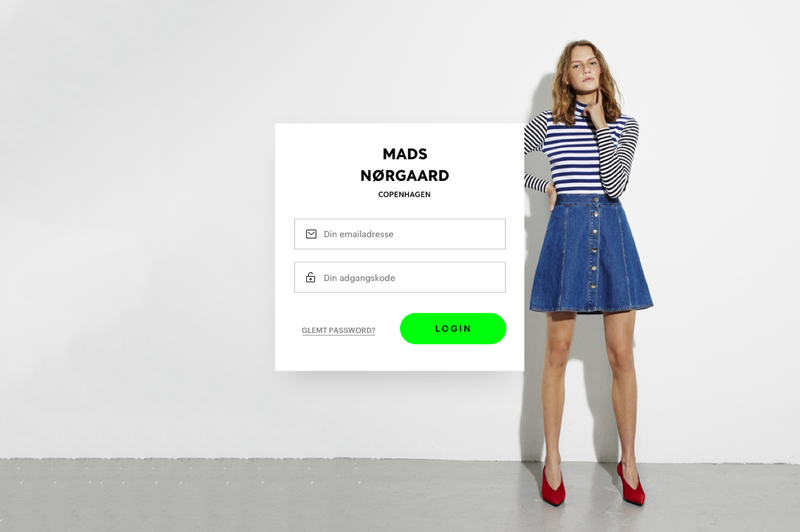 With Kontainer you can style the platform exactly as you wish. That way, Kontainer can be included as part of your brand's expression. As an alternative to Dropbox, WeTransfer and YouSendIt, you get a platform where you are the only sender. The file exchange system Kontainer appears as part of your digital identity both internally in the company and externally to partners, the press, dealers, the photographer, etc. With Kontainer you have the opportunity to present and share your photos, media and files best as possible - internally as externally. Colors, logo and setup can be customized to match your visual identity while maintaining usability. The login feature is easily integrated into your company's own website. That way, Kontainer appears as part of your website, and not as an external system. The ability to customize the functionality and integrate your systems with Kontainer helps support a user-friendly experience that optimizes your workflow and saves time. Usually, we can integrate into all systems, either through Kontainer's own API or using web services to other systems. Contact us to learn more about the possibilities.